Opens like a book. 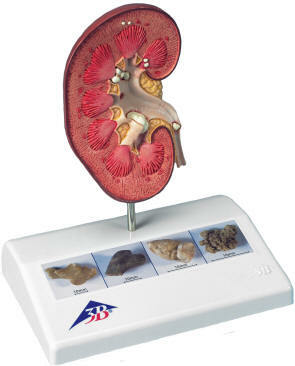 The vinyl plastic reproduction comes with adrenal gland and proximal portion of the ureter and swings open to expose its internal anatomy, including the cortex, medulla, major and minor calyces, renal columns, pelvis and ramifications of the renal artery and vein. Features are hand numbered and identified in the corresponding key. 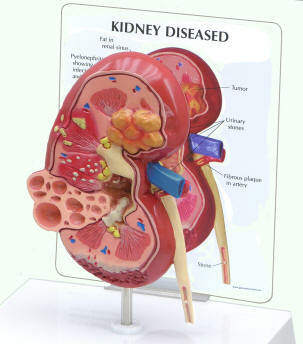 Hinged kidney fully rotates on hardwood base and can be removed for hands-on study. Overall dimension 5 x 5 x 12 inches. 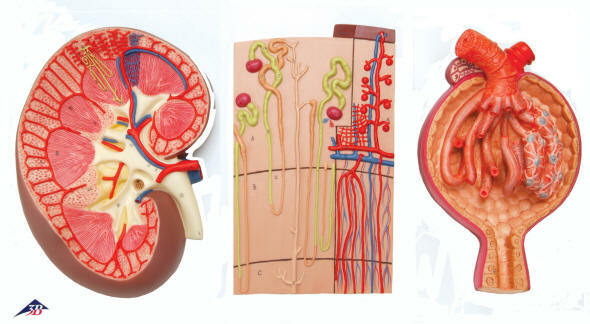 Three vinyl plastic models on a single base consists of: the right kidney scaled to three times life size and sectioned open; a wedge of the kidney magnified approximately 120 times to show two nephrons with glomeruli and tubules; and a single glomerulus magnified approximately 700 diameters showing Bowman's capsule afferent and efferent arterioles and capillaries. 20 x 11 x 4 inches. Each of the three models is available individually. They are listed below. This model shows an open Malpighian corpuscle with glomerulus and Bowman's capsule. 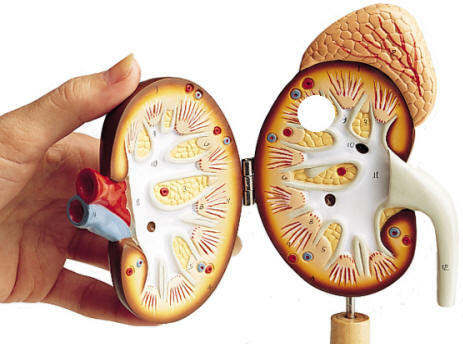 The kidney malpighian corpuscle model is 700 times full-size and is mounted on a baseboard. The kidney malpighian corpuscle model comes complete with a users manual. 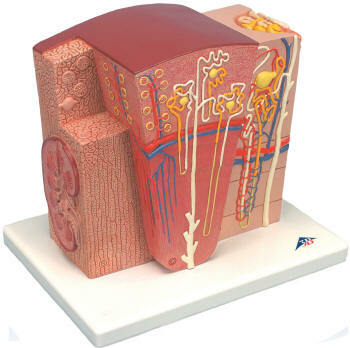 The model depicts a section through a renal cortex and medulla. The nephron model features the renal corpuscles with proximal and distal convoluted tubules, loops of Henle, colleding tubules and blood vessels. The human nephron model is 120 times life size. The nephron and blood vessels model comes with a users manual as well. The upper abdomen organ model shows the duodenum (partially opened), gall bladder (opened) and bile ducts (opened), the pancreas (revealing large ducts), the spleen and the surrounding vessels in natural size. 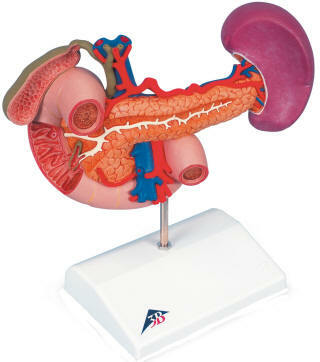 The model illustrates the anatomy of the rear organs of the upper abdomen with high quality craftsmanship. The model comes on its own stand. 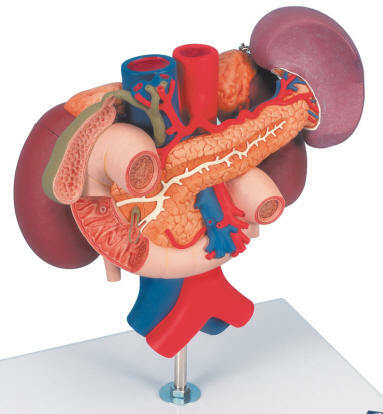 This high quality kidney model with rear organs of the upper abdomen model combines both of the models shown above, depicting the anatomy of the human urinary system and digestive system. 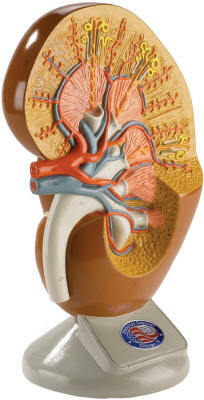 The upper abdominal organs are attached in their natural anatomical positions and are removable from the kidneys. 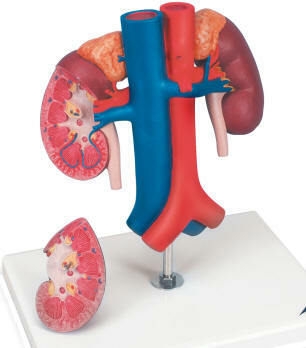 The model features many anatomical details of the kidneys and rear organs. 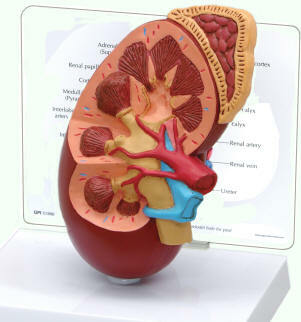 The front half of kidney is removable to reveal renal pelvis. Comes with stand.